This is the first year in I don't even know how long I managed to actually get holiday cards out. Most everyone should get them by Christmas, even! Amazing! I would love to take full credit for this small miracle but in all honesty the credit goes to Tiny Prints and their fantastic selection of customizable designs. 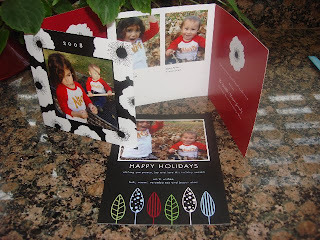 They make it so easy to upload your own photos and personalize their cards that there is simply no excuse to fink out. You'll notice that I actually got two different cards made. That's because Tiny Prints has so many great ones that I couldn't narrow it down to just one. If you have other stationery needs throughout the year (moving notices, birth announcements, party invitations, thank you cards), Tiny Prints has a plethora of solutions. Congrats on getting the cards out! It truly is a feat. And I LOVE Tiny Prints. They're on my list for next year too. I love photo cards, since I started getting min made, they are always out on time. Congratulations on getting your cards out before Christmas.